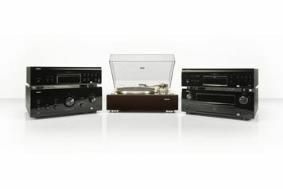 Denon celebrates 100th anniversary with A100 collection | What Hi-Fi? The A100 Collection comprises seven components, each "finely tuned, hand-tested and accompanied by a certificate of authenticity and a special collector's edition book," says Denon. The individual models are: PMA-100 stereo amplifier; DCD-A100 CD/SACD player; DP-A100 direct-drive turntable; DL-A100 cartridge; AVR-100 9.2 multichannel receiver; DPB-A100 universal Blu-ray player; and AH-A100 headphones. All models will be available from October. Check out the special Denon 100th Anniversary website for more details.